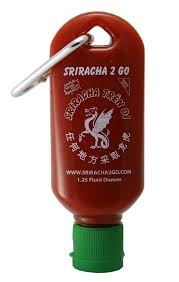 'Sriracha2Go is a must-have for every sriracha lover. With S2G, you’ll never worry about a sriracha-less meal again. No matter where you go, no matter what time of day, sriracha will be by your side. How cute is that? Prices: 1bottle/$7- 3bottles/$15- 10bottles/$35 for more information visit their website. At this time orders are taking 45 days or more to deliver due to demand.